Martín Jimenez Pérez...Instagram: @martinperez33d...wife, Viclena (Gonzalez)...daughter, Malena Kate (6/2/16)...was part of Rangers 2014 Hispanic Caravan, visiting the Joseph J. Rhoads and Charles Rice Learning Centers in Dallas as well as attending a grant presentation at the Oak Cliff YMCA...also took part in the 2015 Texas Rangers Winter Caravan...during time in Texas, made donations to the Texas Rangers Baseball Foundation in 2014-15-16-17 and helped fund the RBI program in Fort Worth...also contributed to the Venezuelan RBI team and the Robinson Chirinos Foundation...has donated funds to Sun Risas, Team Tourette and I Love Venezuela, and made a contribution to underwrite a bullpen at the Texas Rangers MLB Urban Youth Academy in West Dallas...favorite player growing up was Johan Santana. Began season on 10-day disabled recovering from right elbow surgery; reinstated April 5...Went 2-3, 9.67 ERA (22.1 IP, 24 ER) in five April starts...Placed back on disabled list April 30 with right elbow discomfort related to the offseason surgery...Made three starts at three different stops on rehab assignment, Single-A Hickory, Double-A Frisco and Triple-A Round Rock, going 2-0, 0.52 ERA (17.1 IP, 1 ER); reinstated July 13. Moved to the bullpen to finish the season after making 13 starts for the Rangers April 5-August 25, going 2-6, 6.95 ERA (68.2 IP, 53 ER)....Held left-handed hitters to a .271 batting average and right-handers to a .347 average. Led staff in wins (career-high 13), starts (32), and innings (185.0)…also established a career high in strikeouts (115), 2nd on club (Darvish-148)…had team highs in losses (12) and hits allowed (221), both the highest figures of his career…opponents batted .301/.359/.453/.812, 2nd-highest BA and 5th-highest OBP among A.L. starters…his 1.535 WHIP was 7th-highest in A.L., also 9th-highest in club history by a qualifier…ranked among A.L. 's top 10 in following categories: hits allowed (2nd, 221), runs allowed (5th, 108), earned runs (T6th, 99), walks (T8th, 63)... On the 10-day DL 6/23-7/2 with a fracture/laceration at the tip of his right thumb…did not require a rehab assignment…sustained injury when he caught his thumb in the hinge section of a hotel room door on evening of 6/22 in New York... Opened year by going 2-5 with a 3.77 ERA (24 ER/57.1 IP) after 10 starts through 5/24, with 4 of those 5 losses coming in a span of 4 starts from 4/19-5/6 in which the Texas offense totaled 7 runs…in next 11 starts from 5/29-8/4, went 3-5 with a 7.09 ERA (47 ER/59.2 IP) to raise ERA to a season-high 5.46…gave up 7+ runs in back-to-back starts to end that stretch… over final 11 starts beginning 8/9, went 8-2 with a 3.71 ERA (28 ER/68.0 IP) in 11 G/GS to drop final ERA from 5.46 to 4.82.. Won a career-best 7 consecutive starts (zero no decisions) from 8/9-9/8, T2nd-longest streak by a Texas starter in team history and longest since Kenny Rogers in 2005 (club-record 8)…the 7-G win streak (including no-decisions) ranked T4th in the A.L. in 2017 and T7th in MLB…became just the 3rd pitcher in Rangers history to win at least 6 straight starts on 2-or-more occasions (also 8/5-9/3/13), joining Rogers (3x) and Fergie Jenkins (2x). Returned from left elbow surgery and went 3-6, 4.46 (39 ER/78.2 IP) in 14 starts after the All-Star break…logged eight quality starts from Aug. 1 through the end of the season to match Cole Hamels for the club lead. Went 4-3 with a 4.38 ERA (25 ER/51.1 IP) over 8 starts with Texas before elbow surgery...ranked 5th on staff in wins and T7th with 8 starts, and his 2 shutouts were T2nd-most in the A.L. in what would have been his first full season in the majors...selected Rangers April Player of the Month. A permanent member of the Texas rotation after his second recall on June 22, Perez went 10-6 with a 3.62 ERA (50 ER/124.1 IP) in 20 games/starts…his 10 wins ranked T2nd among Rangers, and his 20 starts were 3rd on club…ranked among A.L. rookie leaders in wins (T1st), ERA (2nd), starts (3rd), innings (3rd), quality starts (3rd, 11), strikeouts (4th, 84), and opponents average (4th, .267)…was called on to start club's game no. 163, and took the loss in the Wild Card tiebreaker against Tampa Bay…was vying for a spot in Opening Day rotation in March, but began the year on the Rangers' 15-day disabled list with a fractured bone in his left forearm and stayed in Arizona when the club broke camp. Recalled to Texas on June 26 and appeared in 12 games/6 starts across 3 stints with the club, including 3 starts down the stretch in September...was the 3rd-youngest pitcher to earn a win at the major league level in 2012...was the youngest active player in Triple-A at the time of his initial promotion in June...allowed just one HR to a left-handed batter all year.TEXAS: Went 1-4 with a 5.45 ERA (23 ER/38.0 IP) across 3 separate stints with the club: June 26-July 17, July 23-31, and Sept. 1 to the end of the season...was 1-4 with a 5.88 ERA (17 ER/26.0 IP) in 6 starts with a 4.50 ERA (6 ER/12.0 IP) in 6 relief outings...opponents batted .297 (47-158), .240 (12-50) by lefties and .324 (35-108) by right-handers.SUMMARY: Recalled from Round Rock (AAA) on June 26 when Colby Lewis was placed on the disabled list and made ML debut the following night versus Detroit...entered in 8th inning with Texas up 11-5 (0.2 IP, 4 R-ER)...earned win in next outing, his first ML start, on June 30 vs. Oakland (5.1 IP, 6 H, 2 R-ER)...became the 5th-youngest Ranger (21 years, 87 days) ever to win a start for Texas, youngest since Ed Correa (21.059) on June 27, 1987 vs. Minnesota (G1)...posted first career quality start on July 6 vs. Minnesota, but exited trailing 4-1 and took the loss...was optioned back to Round Rock on July 18 upon Lewis' activation from the disabled list...was recalled just 5 days later on July 23 when Lewis returned to the disabled list...started July 24 vs. Boston, taking a no decision despite his second straight quality start (6.0 IP, 1 R)...optioned back to Round Rock August 1 to make room for Ryan Dempster...recalled for 3rd and final stint on Sept. 1...appeared out of the bullpen in first 3 Sept. appearances with 1.93 ERA (2 ER/9.1 IP), 8 strikeouts, 3 walks...rejoined rotation Sept. 21 at Seattle and went 0-3, 12.46 (12 ER/8.2 IP) in 3 starts...lasted 0.2 innings (5 R) in loss on Sept. 26 vs. Oakland in the shortest start by a Ranger since Derek Holland lasted 0.2 IP on July 2, 2011 vs. FLA, the only 2 outings that short in non-injury or ejection-related starts by Rangers in the last 5 seasons (2008-12).ROUND ROCK: Went 7-6 with a 4.25 ERA (60 ER/127.0 IP) over 22 games/21 starts with the Express...opened the season as the youngest active player in Triple-A...finished T2nd in the PCL with 2 complete games...held left-handed batters to .230 (37-161), while right-handed batters hit .272 (85-312)...surrendered 9 of his 10 HR to RH batters...was 3-2 with a 3.98 ERA (18 ER/40.2 IP) over first 7 starts...went winless in 6 starts from May 14-June 10, posting a 7.48 ERA (23 ER/27.2 IP) with 15 strikeouts, 15 walks, and opponents' batting .370 (44-119)...beginning with start on June 15, went 4-1 with a 2.91 ERA (19 ER/58.2 IP) over last 9 games/8 starts with Round Rock...combined with Mark Hamburger on a 4-hit shutout June 15 vs. Oklahoma City (7.0 IP, 1 H)...fired first 9.0-inning complete game of his career in 6-2 win vs. Iowa...did not allow a hit until a 2-out, solo home run by Josh Vitters in the 4th inning...had totaled 8.2 hitless innings dating back to his previous start prior to the long ball...promoted to Arlington following that start...logged a quality start in 3 of his final 4 outings, going 2-0 with a 3.00 ERA (9 ER/30. IP) during that stretch...tossed 2nd complete game of the season on Aug. 15 at Reno (9.0 IP, 6 H, 1 R-0 ER), retiring 11 of final 13 batters after taking comebacker off leg. Combined to go 8-6 with a 4.33 ERA (66 ER/137.1 IP) in27 games/26 starts between Frisco (AA) and Round Rock (AAA)...held opposition to a .284 average (152-536) with LH batters at.252 (34-135) and RH batters at .294 (118-401)...logged careerhighs in both starts (26) and innings (137.1)...surrendered just oneof his 10 home runs to a lefty...began the season with Frisco andtossed the second perfect game in RoughRiders history on April19 at Arkansas, retiring all 15 batters he faced in a 6.0-inning, rainshortened contest...was the winning pitcher in the 2011 TexasLeague All-Star Game and appeared in the All-Star Futures Gameat Chase Field in July. Spent entire season with Frisco...was one of the youngestplayers in the Texas League throughout the campaign...finishedT10th in TL in strikeouts...was 1-0 with a 4.50 ERA (2 ER/4.0 IP) asa reliever and 4-8 with a 6.02 ERA (64 ER/95.2 IP) as a starter...held opposing left-handed batters to a .267 average (36-135), whileopponents batted .290 (117-404) overall...limited opponents to a.167 average (24-144) when ahead in the count...allowed 2-or-fewerearned runs in 14-of-24 outings...on DL June 1-12 with a crackednail on the middle finger of his left hand...allowed season-high 8runs over 1.1 innings on June 18 at Corpus Christi...tossed seasonhigh 7.0 shutout innings in next start on June 23 at Midland...on DLAug. 7-21 with back strain...recorded quality start in lone playoffstart on September 9 vs. Midland, allowing one run over 6.0 inningsand recording 7 strikeouts...was 1-3 with a 6.50 ERA (13 ER/18.0IP) over 7 games/4 starts with Magallanes in the Venezuelan WinterLeague. Spent the majority of the campaign in Hickory before promotion to Frisco for season's final 4 weeks...named RangersNolan Ryan Minor League Pitcher of the Year after combining to go6-8, 2.90 (37 ER/114.2 IP) with one save and 119 strikeouts in 27games/19 starts...entered the season ranked as the Rangers' 5thbest prospect according to Baseball America...tabbed South AtlanticLeague's top prospect by Baseball America following the season...was 1-1, 1.84 (6 ER/29.1 IP) as a reliever and 5-7, 3.27 (31 ER/85.1IP) as a starter...tossed 4.0 scoreless innings with 6 strikeouts infirst start on April 11 vs. Bowling Green, combining with Tyler Tuftsand Fabio Castillo on a 7-inning no-hitter...selected to the SALLeague All-Star Game, tossing scoreless inning of relief with 2 K's...earned Rangers' Minor League Pitcher of the Month honors in July,going 3-0, 1.08 (3 ER/25.0 IP) with 24 strikeouts over 5 games/4starts...promoted to Frisco on Aug. 10...at 18, was the youngestplayer to finish the season at the Double-A level...went 1-2, 2.51 (4ER/14.1 IP) with 7 strikeouts over last 3 starts of season...loggedseason-high 6.0 innings in final start, recording first quality start ofthe season. Spent first professional season in the rotationat Spokane...rated by Baseball America as the 2nd-best prospectin the NWL and 5th-best prospect in the Texas system...at 17, wasthe youngest player in the NWL...led staff with 15 starts and finished3rd with 53 strikeouts...held lefties to a .197 (14-71) mark...opposition batted just .198 (16-81) with RISP...earned first pro win on Aug.25 at Tri-City with 5.0 shutout frames...took no-decision in his lonepostseason start, allowing 6 hits and 3 runs over 4.0 IP. January 30, 2019 Minnesota Twins signed free agent LHP Martin Perez. November 2, 2018 LHP Martin Perez elected free agency. July 14, 2018 Texas Rangers activated LHP Martin Perez from the 60-day disabled list. July 5, 2018 Texas Rangers sent LHP Martin Perez on a rehab assignment to Round Rock Express. 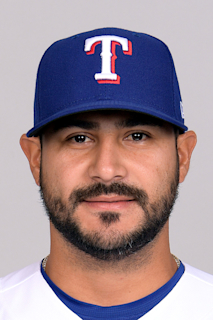 June 30, 2018 Texas Rangers sent LHP Martin Perez on a rehab assignment to Frisco RoughRiders. June 25, 2018 Texas Rangers sent LHP Martin Perez on a rehab assignment to Hickory Crawdads. June 15, 2018 Texas Rangers transferred LHP Martin Perez from the 10-day disabled list to the 60-day disabled list. Right elbow discomfort. April 30, 2018 Texas Rangers placed LHP Martin Perez on the 10-day disabled list. Right elbow discomfort. April 5, 2018 Texas Rangers activated LHP Martin Perez from the 10-day disabled list. March 29, 2018 Texas Rangers placed LHP Martin Perez on the 10-day disabled list retroactive to March 26, 2018. Recovery from right elbow surgery. July 3, 2017 Texas Rangers activated LHP Martin Perez from the 10-day disabled list. June 24, 2017 Texas Rangers placed LHP Martin Perez on the 10-day disabled list. Fracture and laceration of right thumb. July 17, 2015 Texas Rangers activated LHP Martin Perez from the 60-day disabled list. June 27, 2015 Texas Rangers sent LHP Martin Perez on a rehab assignment to Round Rock Express. June 22, 2015 Texas Rangers sent LHP Martin Perez on a rehab assignment to Frisco RoughRiders. June 10, 2015 Texas Rangers sent LHP Martin Perez on a rehab assignment to Frisco RoughRiders. November 3, 2014 Texas Rangers activated LHP Martin Perez from the 60-day disabled list. October 7, 2014 LHP Martin Perez assigned to Navegantes del Magallanes. May 20, 2014 Texas Rangers transferred LHP Martin Perez from the 15-day disabled list to the 60-day disabled list. June 22, 2013 Texas Rangers recalled LHP Martin Perez from Round Rock Express. May 28, 2013 Texas Rangers optioned Martin Perez to Round Rock Express. May 27, 2013 Texas Rangers recalled Martin Perez from Round Rock Express. May 16, 2013 Martin Perez assigned to Round Rock Express from Frisco RoughRiders. May 12, 2013 Texas Rangers optioned Martin Perez to Frisco RoughRiders. May 12, 2013 Martin Perez roster status changed by Texas Rangers. May 5, 2013 Texas Rangers sent LHP Martin Perez on a rehab assignment to Frisco RoughRiders. March 31, 2013 Martin Perez roster status changed by Texas Rangers. October 7, 2012 Texas Rangers activated LHP Martin Perez. September 1, 2012 Texas Rangers recalled Martin Perez from Round Rock Express. August 1, 2012 Texas Rangers optioned Martin Perez to Round Rock Express. July 23, 2012 Texas Rangers recalled Martin Perez from Round Rock Express. July 18, 2012 Texas Rangers optioned Martin Perez to Round Rock Express. June 26, 2012 Texas Rangers recalled Martin Perez from Round Rock Express. March 19, 2012 Texas Rangers optioned Martin Perez to Round Rock Express. November 18, 2011 Texas Rangers selected the contract of Martin Perez from Round Rock Express. July 14, 2011 Martin Perez assigned to Round Rock Express from Frisco RoughRiders. August 21, 2010 Martin Perez roster status changed by Frisco RoughRiders. June 23, 2010 LHP Martin Perez assigned to Frisco RoughRiders. June 6, 2010 Frisco RoughRiders placed LHP Martin Perez on the 7-day disabled list. October 7, 2009 LHP Martin Perez assigned to Navegantes del Magallanes. August 11, 2009 LHP Martin Perez assigned to Frisco RoughRiders from Hickory Crawdads.